In the Fourlands, there are many towns. But only one city, the city of Hacilith and Moren (although everyone just calls it Hacilith). This is Hacilith in 1818, just before Jant left to join the Circle (a story he tells in The Year of Our War). 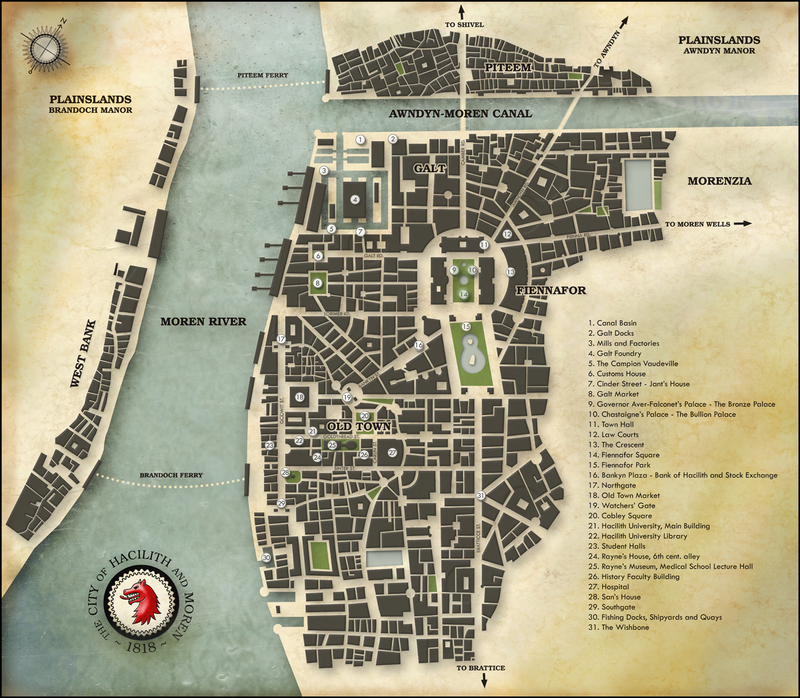 You can see the districts – the heavy industry, mills and foundry of Galt, terraces of Piteem, Old Town, and Fiennafor, the rich civic centre. The city still preserves its various stages of growth: Old Town, which Rayne knew in 620, then Fiennafor, which Simoon knew in 1640. Over the next two hundred years, Hacilith grows further, ribboning out to Moren Wells, and the area of Galt changes, leaving Jant disorientated when he tries to revisit his old haunts in The Modern World.